The factors that shape the destiny of a cell, like that of a fully formed person, remain something of a mystery. Why, for example, does one stem cell in a human embryo become a neuron rather than a muscle cell? And why does another decide to build cartilage rather than cardiac tissue? New research by a team of Rockefeller scientists under the direction of Ali H. Brivanlou illuminates the molecular circuitry that determines a cell's fate. Their work, which appears in the journal Nature, establishes a new platform for studying the earliest stages of human development and could lead to novel treatments for a wide range of ailments. Scientists already knew that embryonic stem cells can differentiate into any of the body's specialized cell types: bone and brain, lung and liver. They also knew that special groups of cells found in amphibian and fish embryos play an executive role in shaping early developmental structures. These groups, called "organizers," emit molecular signals that direct other cells to grow and develop in specific ways. When an organizer is transplanted from one embryo to another, it spurs its new host to produce a secondary spinal column and central nervous system, complete with spinal cord and brain. Due to the ethical guidelines that limit experimentation on human embryos, however, they did not know if a similar organizer existed in humans. To see if it might, Brivanlou and his team performed a series of experiments involving artificial human embryos: tiny clusters of cells, roughly one millimeter across, grown in the lab from human embryonic stem cells. 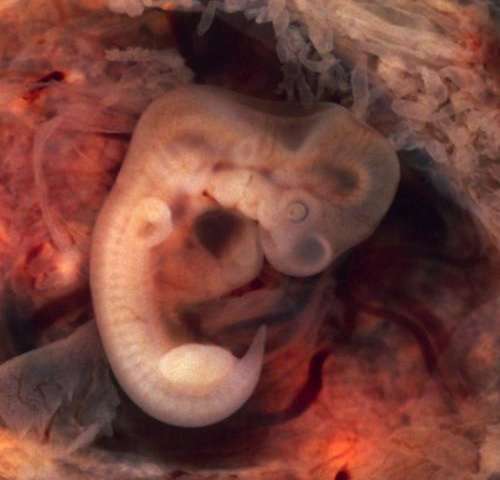 Though a far cry from their natural counterparts, these artificial simulacra nonetheless contain many of the cells and tissues that are present in genuine human embryos, and can be used as experimental stand-ins for the real thing. Previous studies revealed that three different signaling pathways drive early embryonic development in animals such as mice and frogs. By activating those pathways in artificial human embryos confined to Petri dishes, Brivanlou and his colleagues showed that the same molecular signals can also drive development in human cells. When given those signals in the correct sequence, the artificial embryos even generated their own organizers. There is a difference between what cells can do in a Petri dish, however, and what they will do inside a real embryo. To validate their initial findings, the researchers therefore grafted artificial human embryos onto genuine chicken embryos—but not before they had tagged the human cells with a fluorescent marker that allowed them to precisely track the cells under a microscope.What happened next astonished them. Transplanting cells from one species to another is not necessarily easy: the team's previous attempts at combining artificial human embryos with genuine mouse embryos proved exceedingly difficult, and no one had ever successfully grafted human embryonic cells onto an early bird embryo. Yet as soon as they were introduced to their avian hosts, the human cells began laying the groundwork for a secondary spinal column and nervous system—an act that clearly announced the presence of a true human organizer. "To my amazement, the graft not only survived, but actually gave rise to these beautifully organized structures," Brivanlou says. He was even more surprised by the provenance of those structures. For while the progenitors of the cartilage and bone tissue that would eventually comprise a second spinal column were composed entirely of human cells, the beginnings of the nervous tissue that would ultimately form its accompanying spinal cord and brain were composed exclusively of chick cells. According to Brivanlou, the fact that human cells are capable of building new structures in the embryo of a bird—an animal more closely related to the dinosaurs than to us—demonstrates that the ability of animal cells to choose a particular fate has been conserved over hundreds of millions of years of evolution. But the fact that those same human cells were able to instruct chick cells to become nervous tissue also indicates that the molecules involved in cellular communication—the actual signals that cells send to one another to influence their fate—have been conserved for just as long. "Once you transplant the human organizer into a chicken embryo, the language it uses to instruct the bird cells to establish the brain and nervous system is exactly the same as the one used by amphibians and fish," Brivanlou says. Understanding how undifferentiated stem cells become a particular kind of tissue is essential to regenerative medicine, which relies on stem-cell based technologies to heal and rejuvenate failing tissues, or even replace them with freshly grown ones. In addition, the chick-based grafting method invented by Brivanlou and his team represents a powerful new tool for studying the earliest stages of development in human beings—a tool they are already using in other studies. By providing a window onto normal cell differentiation and tissue formation, their approach should help scientists understand when and how things can go awry during the first moments of life. That, in turn, could lead to new ways of preventing miscarriages and birth defects, as well as new treatments for diseases ranging from cancer to diabetes. "If you want to understand something, you must first understand its origins," Brivanlou says. "And if we want to understand the origins of human disease, we must develop ways to work with human cells."